Way To Normal is the third proper album from everyone’s favorite piano rocker. In the nineties, Ben was the leader of Ben Folds Five, who gave Weezer a run for their money as the coolest power-pop band that your nerdy friend liked. Today, Ben is now 42 years old, yet he still appeals widely to the college-aged demographic. His songs continue in his melodic poppy piano rock tradition. His first solo album, Rocking The Suburbs, was fun and had songs that were about characters you could actually care about and relate to, with witty lyrics. But something is missing on this new album. The jokes aren’t that funny, the music is mostly just okay, and when Ben swears, it’s no longer exuberant and much-needed, like it was on the “Fuuuuuuuuuuuck!” that was on the song “Rocking The Suburbs”. Despite its setbacks, however, the album does open with “Hiroshima (B B B Benny Hit His Head)”, a catchy song that offers a nod to Elton John. 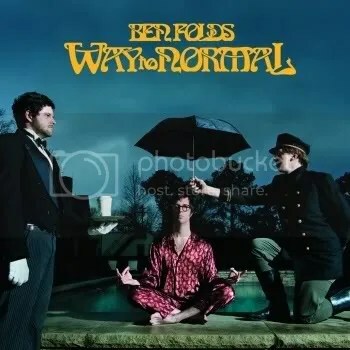 And even if you don’t like Ben Folds, you can listen to the lyrics and picture him falling off a stage in Japan, which is sure to bring a smile to your face. This entry was posted on October 2, 2008 at 12:00 pm and filed under TheSlacker. You can follow any responses to this entry through the RSS feed.